A quarter of the mature female tiger sharks plying the waters around the remote coral atolls of the Northwestern Hawaiian Islands decamp for the populated Main Hawaiian Islands in the late summer and fall, swimming as far as 2,500 kilometers (1,500 miles) according to new research from University of Florida and the University of Hawaii. Their report is scheduled for publication in the November 2013 issue of Ecological Society of America's journal Ecology. The authors' manuscript is available as a preprint. "When we think of animal migrations, we tend to think of all individuals in a populations getting up and leaving at the same time, but it's not as simple as that," said first author Yannis Papastamatiou of the University of Florida. "Some are resident and some are transient." Among all migrating animals, from birds to elk to 15-ft ocean predators, some portion of the population remains behind when the rest leave on their seasonal journeys. Animals have choice. On what factors does choice depend? The answers are important to conservation efforts and the management of our own interactions with the animals as they pass around, over, and through human communities. 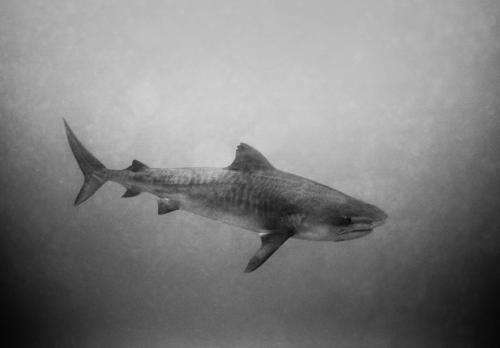 Tiger sharks are present throughout the islands at all times of year. 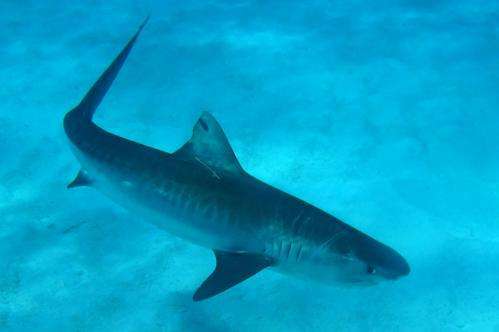 The female sharks' migration from the Northwestern Hawaiian Islands dovetails with the tiger shark birth season in September to early November – and with the months of highest shark bite risk. Though rare, shark bites have historically been most frequent from October to December. Traditional Hawaiian knowledge also warns of danger during the fall months. "Both the timing of this migration and tiger shark pupping season coincide with Hawaiian oral traditions suggesting that late summer and fall, when the wiliwili tree blooms, are a period of increased risk of shark bites," said co-author Carl Meyer of the University of Hawaii. Papastamatiou and Meyer urge people not to leap to the conclusion that this movement of female sharks is directly related to recent shark bites around Maui, Oahu, and the Big Island. Many factors might influence shark behavior in ways that would lead to more frequent encounters with people, Papastamatiou said. Scientists have almost no data on the attributes or particular behaviors of tiger sharks that bite people because bloody conflicts with humanity, though dramatic, are rare. Papastamatiou and colleagues tracked more than 100 tiger sharks over the course of 7 years by tagging each animal with a transmitter that emitted high frequency sound in a unique code. When the sharks swam within range of one of 143 underwater "listening stations" arrayed throughout the islands and atolls of the Hawaiian Archipelago, the station made a record of time, date, and the identity of the shark. The tags last for a minimum of 3 years. The researchers caught only glimpses of each animal. For months between those glimpses, the sharks' movements and behavior remained mysterious. "They could leave Hawaii altogether, and we wouldn't know," said Papastamatiou. Like many good studies, their results offered more new questions than answers. But the research team could detect a few patterns. "One that stands out: although sharks show preference for certain islands, they don't stay resident in specific bays for long periods," said Papastamatiou. "It debunks the old idea of territoriality." This research and other studies like it have solidly overturned mid-twentieth century ideas that tiger sharks stick to chosen territories in specific coves and bays. The territoriality hypothesis led to culls during the 1960s and '70s under the belief that killing sharks in locations where people had been hurt meant killing the shark that had attacked them, eliminating a "problem" shark. But Papastamatiou said his data show that tiger sharks don't hang around the same bit of coastline for more than a few weeks. With concerns acute in the wake of recent shark bites and the death of a German tourist, Hawaiians are anxious to do something to respond. "The one thing I hope they don't do is try to initiate a cull as was done in the 60s and 70s. I don't think it works. There is no measurable reduction in attacks after a cull," said Papastamatiou.